From all-out Halloween makeup to diminutively ethereal looks, there are nearly limitless ways to paint your face in a fairy design. All you need are the right supplies and some basic instructions to get started, and then you can really let your creativity flow. Fairy face makeup makes great use of freehand artwork. You may need to practice a bit to become skilled at using the makeup brushes, but for the most part, it's easy to achieve the look. Here's one way to paint your face like the fairy pictured here. Apply purple eye shadow to the lids of the eyes just to the crease. Swipe a thin line of purple eye shadow just beneath the lower lid of each eye. Dip the wedge makeup applicator into the green face paint and swipe it in a wide arc from the outside corner of each eye, up over the brow bone and down the inside of the nose, curling in toward the cheeks. The paint color will start out darker on the outside of the face and lighten on the way down; this is the desired effect. Dip a clean wedge applicator into some pink face paint, and rub it into the cheekbones up to the sides of the forehead so it just reaches the green paint. Dip a small pointed brush in the dark paint and create a series of dots around the eyes over the green and pink paints. Working with one jewel at a time, apply a small amount of glue to the back of some face jewels, and press them onto your face to create a trail of jewels over both brows. Finish with a coat of purple/pink lipstick to complete the look. Using fairy face paint to create a perfectly magical look is simple. 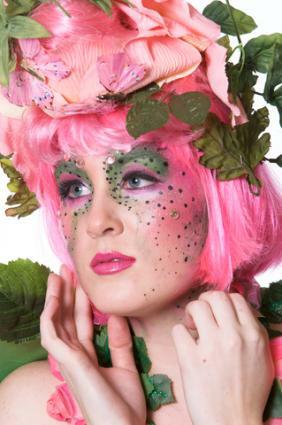 Before you get started, you may want to consider investing in a fairy makeup kit. With several colors included, a kit will give you just what you need to add a level of authenticity to your design. Clean your face well to remove any oils or dirt, and then pat it dry. Test the paint colors on the back of your hand. This will help you determine the best colors to use with your skin tone, as well as test for a possible allergic reaction to the makeup. Make sure your brushes are clean and that you are familiar with the results they produce when you paint with them. No two fairies should ever look completely alike, so don't hesitate to experiment a bit and create your own unique fairy face. Play around with these instructions as a starting point, and add or change colors as you go. With a little practice, you should be able to produce a fairy look you really love. Top Women's Perfumes That Attract Men By Laura Williams, M.S.Ed. What Do High Cheekbones Look Like?